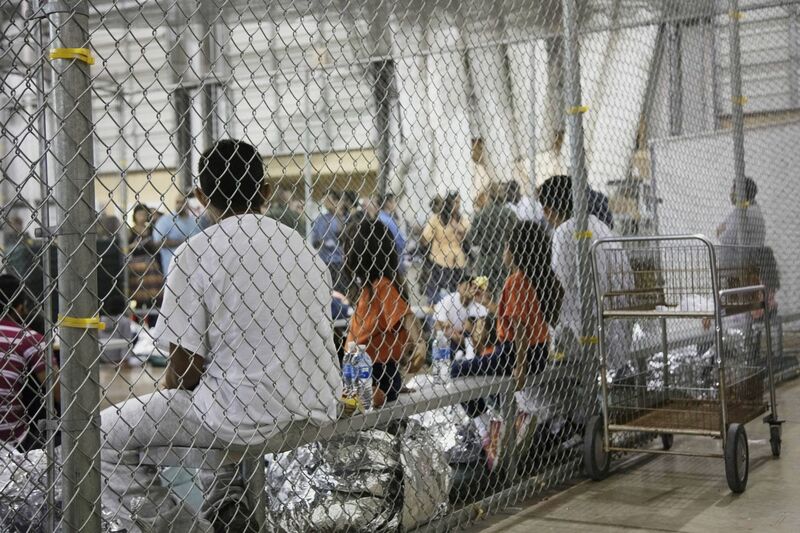 In this photo provided by U.S. Customs and Border Protection, people who've been taken into custody related to cases of illegal entry into the United States, sit in one of the cages at a facility in McAllen, Texas, Sunday, June 17, 2018. More than 2,300 minors have been separated from their parents since April, when the Trump administration launched its "zero-tolerance" policy that called for prosecuting illegal immigrants and taking their children away. When Mary McCabe crouched down this month in front of a 7-year-old immigrant girl to ask her a few basic questions about her family, the girl wasn't able to answer — she couldn't stop crying. "A lot of them are really traumatized from having been separated from their parents and have trouble even talking," said McCabe, a Know Your Rights Coordinator with HIAS Pennsylvania, a Philadelphia-based organization that works with immigrants resettling in the region. Some of the children she's met over the last month are concerned their detained parents will be deported — others, particularly younger children, "just want their Mommy or their Daddy." Since May, McCabe has been in contact with about a dozen children now living in Pennsylvania who were separated from their parents as a result of the Trump administration's "zero-tolerance" policy. Amid public outcry, the president halted the practice Wednesday by executive order. The children living in a shelter in eastern Pennsylvania range in age from 6 to 16 and migrated with their families from El Salvador and Guatemala, McCabe said. At least several dozen children are being temporarily held in Pennsylvania while their parents or grandparents await criminal prosecution for illegally entering the United States. The children are often housed in a shelter, in most cases for several months, until the federal government places them with a sponsor in the United States, typically a family member. The Department of Homeland Security has said that more than 2,000 children were separated from families since about mid-April. The administration contended this week that the separations weren't the result of its policy but were due to court decisions and congressional inaction. McCabe wouldn't disclose the name of the Pennsylvania shelter where she's met children who were separated from their parents, saying she's not authorized to name it publicly. WHYY, citing anonymous sources, identified the shelter as KidsPeace, a nonprofit provider with locations in the Lehigh Valley. A spokesperson at KidsPeace said the organization couldn't release information about its clients, citing health-care privacy regulations. He referred questions to the Department of Health and Human Services' Office of Refugee Resettlement. That office didn't respond to a request for information. The children being housed in the Lehigh Valley are there in addition to dozens more being sheltered in Western Pennsylvania. The Post-Gazette reported the Pittsburgh-based Catholic nonprofit Holy Family Institute, which contracts with ORR, is housing 50 child migrants separated from their parents as part of the administration's zero-tolerance policy. The Center for Family Services Inc., an agency based in Camden, also contracts with the federal government to provide shelter to immigrant children who crossed the border. The agency didn't respond to multiple requests for comment, though an official told the Courier-Post that the Center, which operates 17 safe homes in South Jersey, is currently housing 27 children for the federal government. Rep. Donald Norcross, a Democrat whose district includes Camden, attempted to visit the facility to meet with the separated children there, but was told he needed to go through the Department of Health and Human Services. The Department denied his request for an immediate visit and, according to Norcross' office, required he provide dates at least two weeks out. HHS refused his request to waive the two-week policy. "The public's representative has a right to visit these children and make sure they've been treated well and that efforts are being made to reunify them with their families," Norcross said in a statement. "Right now, it seems easier to visit nuclear weapons sites than kids in my own district who have been forcibly taken from their parents." Philadelphia city and Pennsylvania state officials say they are largely in the dark about how many separated children are being housed here or could be on their way. Colin Day, a spokesperson with the Pennsylvania Department of Human Services, said the state has one federal contract to shelter refugee children through Bethany Christian Services. The state agency said it has not heard of an influx of children placed there. Other organizations contracting directly with the federal government could be housing separated children without the state's knowledge. Day said his department does not have a list of those contracts. "They're being removed by the feds and placed by the feds," Day said. "Unfortunately that is the situation. We're trying to get a hold of Homeland Security to find out where our number is, and at this point, I honestly don't have a number because those contracts are outside of our scope and our purview." The city's DHS commissioner, Cynthia Figueroa, said Philadelphia's child welfare system would be contacted only if the federal government needed more help than it has through its existing contracts. McCabe, who provides immigrant children with information about the immigration and courts system, typically works with minors who crossed the border unaccompanied. She said HIAS Pennsylvania saw very few migrant children separated from their families prior to the Trump administration's zero-tolerance policy, though that's changed since May and the group has seen a "steady trickle" of kids separated from their parents. She said she meets with new children placed there each week — she plans to go to the shelter Friday and anticipates seeing more children separated from their parents, in addition to the dozen she's already met with. Typically it's up to the shelters to work with the federal government on issues related to family reunification. HIAS Pennsylvania attempts to learn about each family's case — even if that involves calling parents still in their home country — so they can connect them with the appropriate legal services. As Homeland Security officials work to settle what some have called a humanitarian crisis at the border, lawmakers in Washington are hashing out legislation that would address immigration and border security. A hard-line measure supported by Trump and conservatives was defeated in the House on Thursday, while a so-called compromise Republican bill will likely be voted on Friday. Officials with the Federation for American Immigration Reform, a D.C.-based think tank that supported the more conservative immigration bill, have defended the president and his administration's handling of families crossing the border illegally. Ira Mehlman, a spokesman with the group, said the president had two options: Either separate families to detain parents or provide parents a "get out of jail free card" by returning children to them after 20 days, the longest time the government can keep children in immigration detention under a federal court decision. "Both of these were bad options," Mehlman said. "There is no option. Congress has known this problem has existed for a long time." McCabe said the presidential executive order signed Wednesday doesn't appear to reunite children with their families. She said she remains concerned about the administration's approach to dealing with migrant families crossing the southwestern border, saying the federal government shouldn't be in the business of indefinitely detaining undocumented immigrants. "Putting kids and parents in cages," she said, "is just as bad as putting kids in cages."